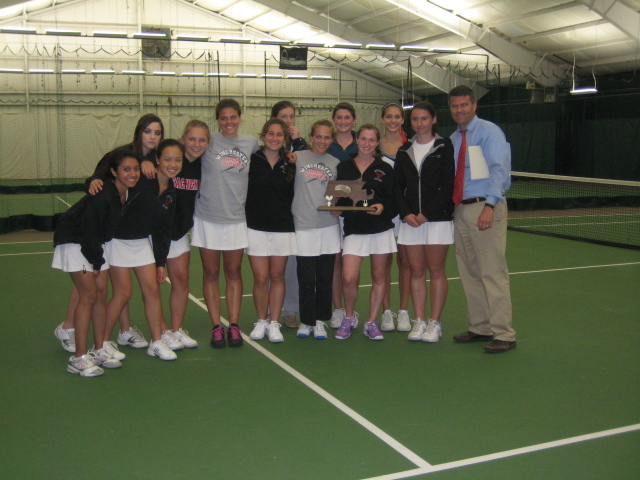 Winchester High School Tennis STATE CHAMPIONS! son Christian on the boys' team and Paula Sughrue's husband coaching the girls to victory. This amazing group of kids have worked hard for those memories, many of them taking up the sport at 10 or 12 years old. 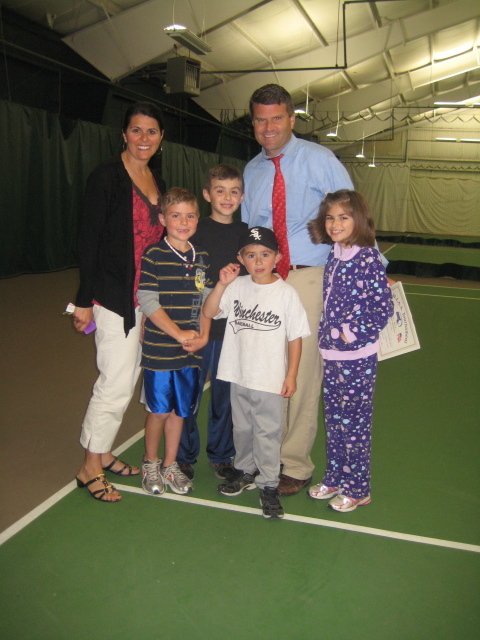 They commit themselves at an early age, dropping other sports to focus on tennis with a personal coach and participating in many advanced level tennis programs around the area, often having to travel a bit after a long day at school to do so. Many participate in USTA League play which monopolizes most of their weekends in addition to having access to the Winchester Indoor Lawn and Tennis Center where they also can spend many hours training. Add this to their high school work load, and winning the State Championship is not as small a feat as the press would make it sound. Their dedication, and the support and sacrifices made by their families and other people in the town all back up their success in winning the Championship Trophy year after year. The most amazing accomplishment Is that these kids are just as devoted to their schoolwork as they are to their sport. Graduating from WHS tennis teams this year are a top notch group of boys and girls heading on to tackle other challenges and opportunities in their lives. Their individual stories are equally impressive: Christian Boulanger is heading off to Bowdoin College to major in Economics after training hard all summer in hopes of making the varsity tennis team. Abigail Shewalter is joining the US NAVY where she will play tennis while training to support her country. Alex Saich is going to Harvard University after taking an interim year to work on projects in China. Katy McKeough is going to Carnegie Mellon to study Physics. Alex Criss is going to Trinity College where she was recruited to play tennis. David Stringfellow is going to MIT to study engineering. Michael Lauretano is going to Endicott College where he will play on the varsity tennis team. Ryan Connolly was able to play two sports during high school and is a top soccer player. He was recruited to play soccer at Wheaton College. Ben Davis is doing a PG year to continue with two sports that hes passionate about: soccer and tennis while he decides which one hed rather pursue at the collegiate level. WHS Boys Tennis receive their trophy. Go Sachems! Contributed by Margo Boulanger and Paula Sughrue.